As Democrats have become more and more confined to the coasts, new polling shows that Republican governors are overwhelmingly popular everywhere – from red, to purple, to even the bluest of states. · 6 of the 10 most popular governors – all Republicans – are up for re-election in 2018. 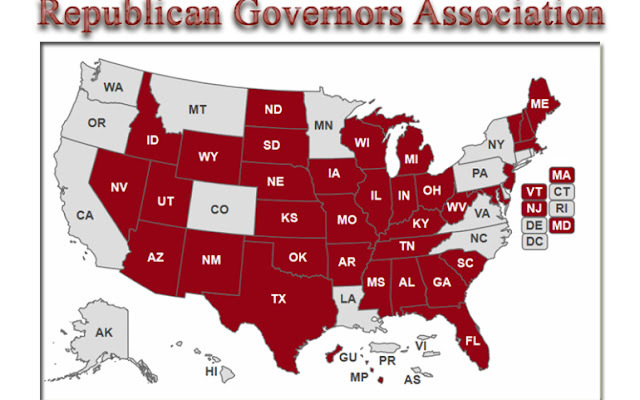 · 3 of the 4 most popular governors are in cobalt-blue states – proving Republicans can win and govern effectively anywhere. · Connecticut Democrat Governor Dan Malloy’s approval rating dropped to an all-time low of 23%, with 68% disapproving. His failed tax-and-spend policies have made him America’s least popular governor. · The approval rating of Rhode Island Democrat Governor Gina Raimondo, who’s also vice chair of the Democratic Governors Association, dropped to an all-time low of 40%, with 47% disapproving, making her the most vulnerable incumbent Dem governor running in 2018. · Oregon Democrat Governor Kate Brown’s approval rating dropped 13% in less than a year after she pushed a massive tax hike. Compiled by the Republican National Committee. Most of the top political polls that got the 2016 presidential race dead wrong are continuing to use a flawed methodology in rating President Trump's approval ratings that favors Democrats, women and younger voters, according to a new analysis. The report shows that the mainstream polls oversample an average of 29 percent more Democrats than Republicans and the results skew anti-Trump. The result is that it robs Trump of about 8 points in his approval ratings, from 46 percent to 38 percent, it said. And, said the report from Bombthrowers.com, one outfit, the Economist, used 58 percent more Democrats than Republicans in a recent poll on Trump's approval ratings. "In every poll, Democrat respondents outnumbered Republicans by significant amounts. The Economist poll was the worst. Only 24 percent of respondents (360) were Republicans compared to 38 percent (570) Democrats – which means that 58 percent more Democrats were polled than Republicans, as shown in the %D/R column. On average, in these seven widely recognized national polls, only 29 percent (409 people) of the total 1,383 polled were Republicans, while 37 percent (518) were Democrats. Another way of saying it is that, on average, 29 percent more Democrats than Republicans were polled," wrote James Simpson, an economist, businessman and journalist. Simpson called the practice "fraud." He also noted that the random sample used by many pollsters includes too many liberals and even illegal immigrants, and said that choosing "likely voters" is the best gauge. McLaughlin and Rasmussen use likely voters and show Trump's approval rating higher than the others. John McLaughlin, a pollster for Trump, put the Bombthrower report on his company's website and emailed it around Washington. In it, McLaughlin said the big polls skew results for Democrats and against Trump. "Not only does it affect [Trump's] job rating and favorable rating, it also affects the policies and issues these polls purport to measure. Maybe this is why so many Republicans, Independents and Trump voters seem to disregard media polls. It appears the media is once again sacrificing its credibility for its liberal, anti-Trump bias," said the pollster.